Show your support for your community and your environment by joining ReLeaf Michigan. As a non-profit 501 (c)(3) membership organization, we rely on our members to help us fund our work. It's easy to become a member through a safe and secure online donation. All membership fees are tax deductible to the fullest extent allowed by law. Thank you for being part of ReLeaf Michigan! 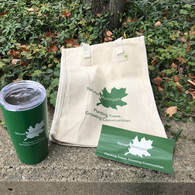 Receive free ReLeaf Michigan merchandise as our way of saying thank you. Donate $250 or above and receive all three! With all donations of $25 or more, you'll also receive a one year membership to the ReLeaf Michigan organization. You can support ReLeaf Michigan with a credit card, PayPal, or sending a check. Donate using a credit card by clicking "Make a Donation" below. You can also send your donation using PayPal by clicking here.